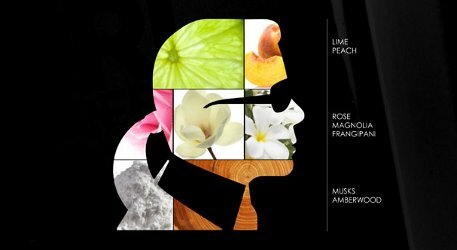 That's Karl Lagerfeld, talking about perfume on the occasion of the launch of his latest him & her fragrance duo, developed under new licensing arrangements with InterParfums. Clearly the man has good taste in perfume, and presumably he has the wherewithal to hire the right sort of people to develop a hit fragrance, but so far, he hasn't managed to produce a lasting classic under his own name: all of his earlier perfumes, under licenses with Coty and Elizabeth Arden, are off the market. Should you dislike it, fear not, the 'full-bodied' part doesn't last for long: Karl Lagerfeld Eau de Parfum fades to bland in nearly record time. After about 45 minutes, it's a vague woody musk with the remnants of a few "flowers". It smells like what might be the lingering remains of yesterday's perfume, but that little bit, surprisingly, lingers on for another four or five hours before fading away to nothing. Karl Lagerfeld Eau de Parfum was developed by perfumers Serge Majoullier and Christine Nagel. It is available in 25, 45 ($65) and 85 ($85) ml, and in a 10 ml rollerball ($25). 1. Via Karl Lagerfeld Smells Like "Fresh, Ironed Linen" at Elle. 2. Choupette is his cat, and it is a mark of the fawning attention Lagerfeld receives in the press that even I know the name of his cat. And that Choupette has two personal maids and her own iPad. 3. 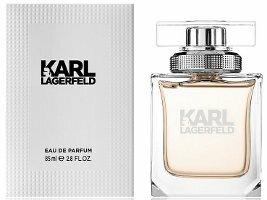 The concise opinion of @fragrantreviews at Twitter: "Karl Lagerfeld for Him: A bland fougère consisting of top notes of 'blah', heart notes of 'yawn' and an intense blast of 'meh' in the base *". And their take on the women's: "Karl Lagerfeld for Her: A passable floriental in the same vein as Guerlain’s L’Insta… *snore* Oh, sorry, I fell asleep for a moment there **." 4. The description at Harrods: "Karl Lagerfeld’s two new fragrances echo his edgy style, whilst conveying sophisticated elegance and classicism with a bold, modern twist. Together, the duo form a rock and roll story of desire, of irresistible magnetism conveyed by their unique scent. " 5. Again via Karl Lagerfeld Smells Like "Fresh, Ironed Linen", at Elle. LOL! Excellent story. That’s what it is, a blending experiment gone wrong. I was looking at the notes and thinking, Hmm, could be nice, or could be boring. I’ve been open enough about loving the original Chloe. But you say this one goes to dull drydown in 45 minutes? GRRRR. That seems completely pointless. If the opening was more appealing, it would be a bit less pointless, but it’s basically screechy top notes, then a “just ok” heart, then dull. As I said on twitter a bit ago, this spring’s fragrance releases are using up all my synonyms for meh. If his most recent mainstream efforts fell short, why didn’t KL go niche this time I wonder? He surely is rich enough already. Presumably it’s the attention of a mass release he is craving. He must be addicted to attention. Relevance deprivation may be what he fears more than anything in life. So if true, the quality of the juice is not an issue and its pointless investing in it. Well, darned good question. The Kapsule trio was “sort of” niche-ish (you could call it exclusive mainstream, at least) — it wasn’t widely distributed, and the packaging was much nicer than for this. But they were good and not great, and they didn’t get much adoration either. I don’t know what the perfect mix is or how to achieve it, but I’m surprised he signed off on this scent — it doesn’t seem likely to achieve anything anybody might want (relevance, sales, attention, whatever). It’s not young and trendy, or mature and sophisticated. It’s not nearly as likable as something like Armani Si (which came to mind because it’s also by Nagel and won 3 awards in the past 48 hours). I also thought of Elle L’Aime (Nagel and Serge Majoullier), which is hardly a masterpiece but which is at least spunky and fun. My sense is that, in general, KL works better within an established idiom (e.g., Chanel), but is less successful at creating his own. That’s why I’ve long considered him a better interpreter than an originator. The men’s version is very puzzling– it is so dead common that one wonders why they even bothered. It smells like a typical department store fragrance for high school boys. It’s strident and graceless, and is completely lacking in imagination. I’m confident that was precisely the intent. Did you happen to smell the women’s too? From what I’ve read, the women’s is better than the men’s, which means maybe I don’t even want to smell the men’s at all. I haven’t tried the women’s. I’ll give it a sniff next time I’m at a mall. I doubt it will be worth the effort, but if you do happen to smell it, would love to hear if it’s indeed better than the men’s. I nearly choked on my tea with that closing statement.Funny! I love Christine Nagel. Usually the fragrances she works with are so lovely. Kind of shocked on this one. She has done some really lovely work, it’s true. Her recent offerings for men for Lalique are beautiful. I’m curious to see how/what she does for when she takes over for Ellena at Hermès. Yes, me too…she’s obviously incredibly talented.